While USB Mass Storage is the common media of data exchange, it is also one of the major source of viruses. With a network that has several users, controlling the spread of virus is more challenging. One way to reduce risk is to disallow the use of removable disk and usb drives. PenyuUSB is a free software that allows you to disable or enable USB mass storage controller to prevent the drive from accessing the PC. 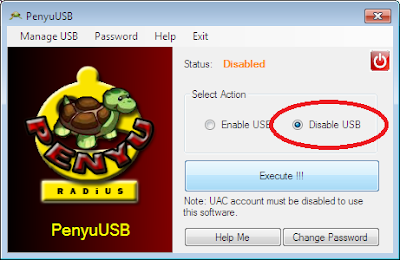 The app password protect the use of USB drive. This password should only be shared to authorized users only. The app works on all Windows version including Windows 7.